Ascension is a fast-paced deck building game designed by Magic Pro Tour champions Justin Gary, Rob Dougherty, and Brian Kibler. All the depth and replayability of a collectable card game in ONE box. I have never previously played card - deck building games before and so therefore never played the likes of magic the gathering or dominion so this is the first of its type for me. I really like this game on the basis that it isn't difficult to understand attack or purchase! The quality of the board and the cards is impressive - like the other reviewer said the box is really big and this is probably due to the expansions planned. What I have found is that it is really addictive and I always want that one more game!!! It doesn't take long to set-up and the rules are pretty simple and easy to follow. Overall - nice game and good for people just starting out playing deck building games. Players build decks which they use to earn Honour points which is earned by playing certain Hero or construct cards or by defeating monster cards on the gameboard. The cards in the deck also count towards the final honour score and the player with the most at the end of the game wins. The end game is triggered when a pre-determined amount of honour has been awarded (set by the number of players) players then get one last turn and final scores counted. There is a lot fun to be had here, players build and burn cards to form a deck they think will earn them the honour they need. There is an element of luck here (as the face up cards players can purchase or fight are drawn at random), but there is also skill in deciding what cards to buy and discard to make your deck strong, there is a certain amount of player interaction as cards can have an effect on other players cards. The thing that makes me like this game more than Dominion, is Dominion once experienced players work out card combos are hard to beat by new players. This game presents a much more even playing field whilst retaining fun and strategy elements. Finally the artwork on the cards, the quality of the board and components are very high providing a coherent overall theme for the game. 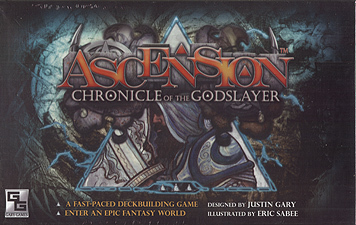 �Ascension: Chronicles of the Godslayer\\\\\\\' is a deck-building game in which up to 4 players compete to earn the most honour by hiring heroes and killing monsters. Considering that all that you require from the box to play the game are the 200 cards, the box is massively oversized. Not the worst thing in the world if the designers are planning expansions though. The game includes 200 cards, 10 cards in each of 4 identical starting decks (one for each player), a 100 card �portal� deck, along with 3 decks of �always available� cards. The cards are decent quality, but given the amount of shuffling involved in the game, they�ll not take long to show wear. If you enjoy this game, seriously consider sleeving those cards. The artwork on the cards is good and is all by the same artist, which is quite unusual in this kind of card game and helps to keep thetheme and look of game coherent. The game also comes with a board. This is largely irrelevant and merely displays the layout of the cards, but it is of high quality, looks good and adds theme to the game, which may have been the intent of the designers. In addition to Honour Points shown on each card, a pool of plastic gems is available, small clear gems for 1 point, larger red ones for 5. The size of the pool is dependent upon the number of players, and is the depletion of this pool that prompts the end of the game. The rulebook is actually quite large considering its contents. The text is HUGE and the card images MASSIVE. The rules are simple and you�ll be up and running within 15 minutes of opening the box. Each player starts with a 10 card deck, from which a hand of 5 cards is drawn. The starter deck includes 8 Apprentices, heroes who provide 1 �Rune�each. Runes are the basic currency of the game and are used to hire / purchase new heroes. Also present in the starter deck are 2 Militia, these heroes provide 1 �Power� each. Power is used to defeat monsters, which in turn provide Honour and all manner of other bonuses. The main �Portal� deck is comprised of 100 cards, and contains the Monsters which threaten your world, and also the Heroes and Constructs of neighbouring worlds who are coming to your aid. There are always 6 such cards face up and available from the centre of the board, replacement occurring immediately one is taken. A further 3 spaces on the board are permanently occupied a deck of Mystic cards (an upgraded Apprentice), a deck of Heavy Infantry cards (upgraded Militia) and a single Cultist, a Monster type so abundant that it can be killed as many times as you can afford to spend 2 power each turn, which is handy when Monsters are scarce in the centre row. Heroes are cards that will provide you with Runes, Power or other abilities, such as extra card draws to use in the turn you play them. Constructs, once played, remain in play and affect their controlling player for the rest of the game, giving permanent bonuses or abilities. Monsters, once killed are Banished to the Void. With the exception of the starter decks, all cards carry an Honour value. Most of them are worth 1 or 2 Honour, but some are worth many more. Monsters banished to the void earn points that are drawn from the gem pool. It is the combined sum of the Honour on your cards and your gems that decided on the winner at the end. The game therefore tends to follow a pattern of enforced thrifty purchasing in the early turns, extravagant buys and big kills in the middle, and quite a lot of maximisation at the end, ensuring the most Honour for your Runes. I have, so far, managed to stop myself from comparing the game to Dominion. While Ascension has some comparable mechanics to Dominion, the look, feel, pace and attitude of the game is quite different. You�ll not spend a lot time analysing the available cards or developing your strategy before the game begins. There are certain Heroes that you will buy as soon as they become available, certain Monsters you will definitely fight, and you will almost certainly want to pick up any constructs that come along purely for their ongoing abilities. What I�m saying is, if depth of strategy is what you are after, look elsewhere. This is a fast moving game that you can have out of the box, play and put back in the box in less than half an hour. There are choices to be made, but nothing that will tax the average gamer. Nor the below average gamer for that matter. Ascension is great fun when you�re in the mood for something a little less cerebral.